Established in May 2003, MIDWIL Trading Inc. Qatar is mainly focused on the Trading, Contracting, Maintenance and Installation of Safety Roads Products, Street Lighting, Traffic Signals and Security Fences. Our core activities are based on the belief that the service provider must listen, evaluate and focus on the needs of their clients while performing with optimum technical and professional approach. Within short period of time, MIDWIL has gained an excellent reputation for the quality of its products and installation work which gained the ISO 9001, 14001 and OHSAS 18001 certification. Every project undertaken is executed with utmost detail and precision. We are committed to carrying out our activities to the highest possible standards meeting Safety and Quality Requirement. The key to the success of our Business is the quality of our workforce. We have highly skilled and motivated employees who have built the company&apos;s reputation through the quality of the services provided. MIDWIL Trading Inc. - Qatar has been awarded a subcontract work with Dogus – Onur JV. for the project Access Roads to Al Wakrah Logistic City from Public Works Authority (ASHGHAL). The work consists of installation of Crash Barriers. MIDWIL Trading Inc. - Qatar has been awarded a subcontract work with Al Darwish Engineering for the project Grading and Temporary Roads for Birkat Al Awamer from Public Works Authority (ASHGHAL). The work consists of installation of Crash Barriers. 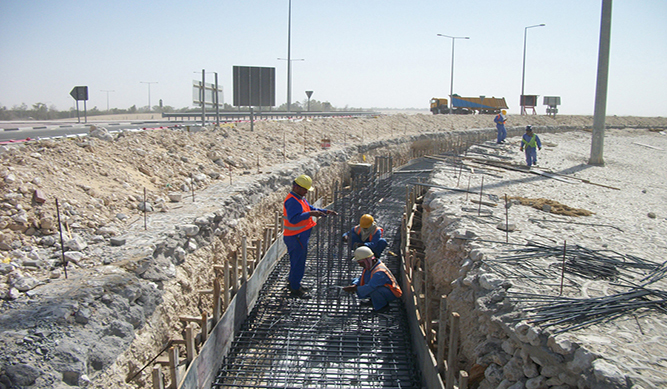 MIDWIL Trading Inc. - Qatar has been awarded a subcontract work with Tekfen Construction Company for the project Design & Build of Al Khor Expressway Project from Public Works Authority (ASHGHAL). The work consists of installation of Crash Barriers. .
MIDWIL Trading Inc. - Qatar has been awarded a maintenance contract with Ashghal for the project Upgrading of Vehicle Restrained Systems Throughout Qatar Contract-1. The work consists of Supply, Installation, repair and maintenance of Fence and crash barriers. To foster better relations, increase productivity, promote teamwork and mental well-being among employees, the company organizes a range of activities yearly for the staff.